Have you ever bought something brand new, taken it home and positioned it pride of place amongst your other things, marveled at its shiny-ness… and then realised that your other things look slightly more drab than they did before? Slightly less satisfying, slightly more tired? Have you ever felt that now your new shiny thing is making all your other stuff look bad, maybe it’s worth upgrading all of that too? Before you act on you impulses and head straight back to the shops, be warned. It will only bring tragedy. At least, that’s what happened to Denis Diderot. Denis Diderot was an 18th Century French writer who was given the gift of a beautiful scarlet dressing gown. Initially he was very pleased with it. However, he felt his other possessions looked shabby in comparison, and slowly began replacing them with more luxurious ones that matched the splendour of the dressing-gown. His straw chair was replaced with a leather one, a wooden plank bookshelf was replaced with an amour, some unframed prints were replaced with more expensive artwork. Not only that, but new items were added: a writing desk, more art, a bronze clock with gold edging and a large mirror over the fireplace. He wanted his home to be as luxurious as he felt whilst wearing the gown. 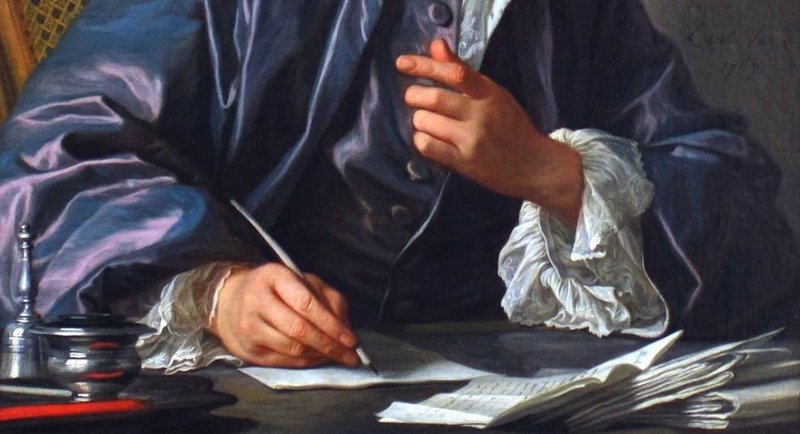 These new purchases spiralled Diderot into debt, and led him to write the essay “Regrets on parting with my old dressing-gown, or a warning for those who have more taste than fortune”. He came to regret his new purchases, all the result of the scarlet dressing gown, and wished he had kept his familiar old dressing gown. Diderot was the first one to write about it, but the experience he writes about are actually a recognised social phenomenon – the process of spiralling consumption resulting from dissatisfaction brought about by a new possession. It’s called the Diderot Effect. Next time you buy something new, you’ll probably feel some dissatisfaction with your old things. That’s understandable; no doubt the new thing is bright and polished and shiny and packaged splendidly. However, you can be mindful of these feelings without acting on them. Remember Diderot’s lesson. Let the feelings pass. There’s no need to rush out to the shops to replace everything else too. Shiny new things fade with time. Unpaid credit card bills don’t. Amazing! I’d heard of the diderot effect but had no idea it all started with a luxurious dressing gown! Thanks for that! Wow, that’s even better – rather than trying to ignore the feeling afterwards, be aware of it before you even make the purchase! I love it! Well said. We live in such a throw away society that no one values much. I’ve been tempted to go back to cash. If I don’t have enough cash in my pocket, then I can’t buy it. Credit cards are a false sense of security and they play right into the Diderot Effect. I read a great tip once about a lady who stored her credit card in a block of ice in the freezer so she couldn’t make any impulsive purchases! I do use a credit card but I think of it as cash – I never spend more than I have in my account and I ALWAYS pay it off in full each month. If I couldn’t use it like that I wouldn’t have one. You’re right though, they do play right into it for a lot of people. This is absolutely amazing!I heard about it but never understood it.Thank you very much for sharing this with us.